Life has been a bit hum-drum in my village for the past couple of weeks, so I was delighted when a friend decided to throw a small dinner party last evening. It gave us a chance to do a belated celebration for Christiane's birthday last month and also gave me a chance to photograph our host's new acquisitions. He's become an art collector! 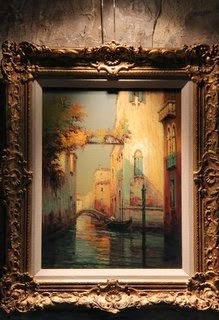 He particularly likes Venice and these two paintings are scenes of that magical city done by Alphonse Lecoz. I like the one above best. The gondolier is almost silhouetted against the robin's-egg blue sky that is then reflected in the water of the canal. It was the first painting that he bought. Which, of course, wasn't enough, so he added this one on the left. "No more," he said. "I'm done"
"Yeah, sure," and I was right. 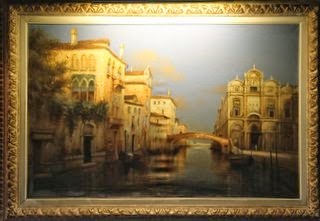 Very soon this lovely canal scene joined the other two on the living room wall. "Now, I'm done." To which I replied "Sure you are." Wink, wink. And right on cue, this painting appeared, hanging on the opposite wall. 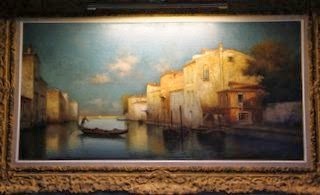 While it's not Venice, its boat and water theme nicely complements the other three paintings. He insists he's done. And this time I think he might be right. 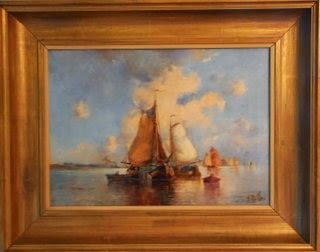 No more rainy, dreary winter days on the computer looking at online art auctions...and buying beautiful paintings. It's spring, and his attention has turned to his garden. He's done collecting...for now!